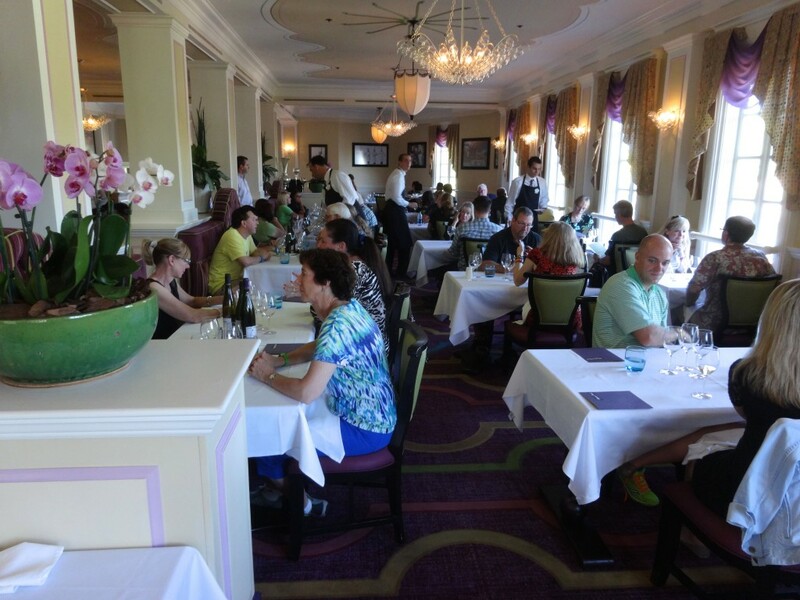 We’ve never done a French Regional Wine Lunch during the Epcot Food & Wine Festival (Lisa and Andy have, so we thought “okay, we’ll do one with them; try something different for us”) [note: Nick and I have never even eaten at the sit down restaurants in the France Pavilion]. 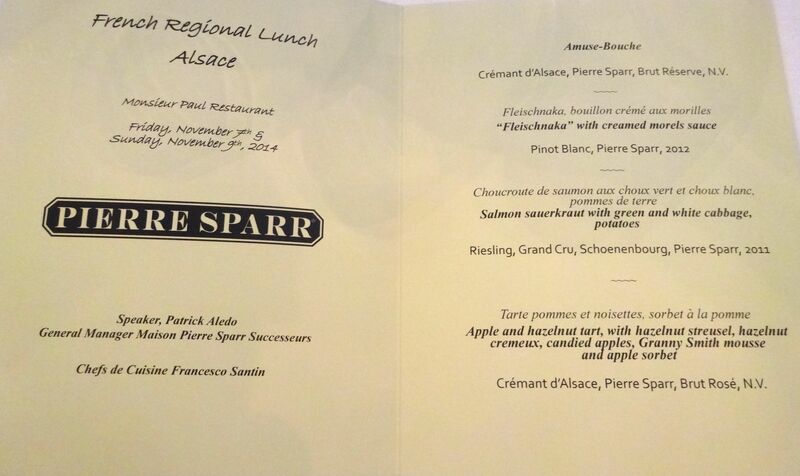 I was pleased that the region we would be experiencing was Alsace (think French-German food and wines). 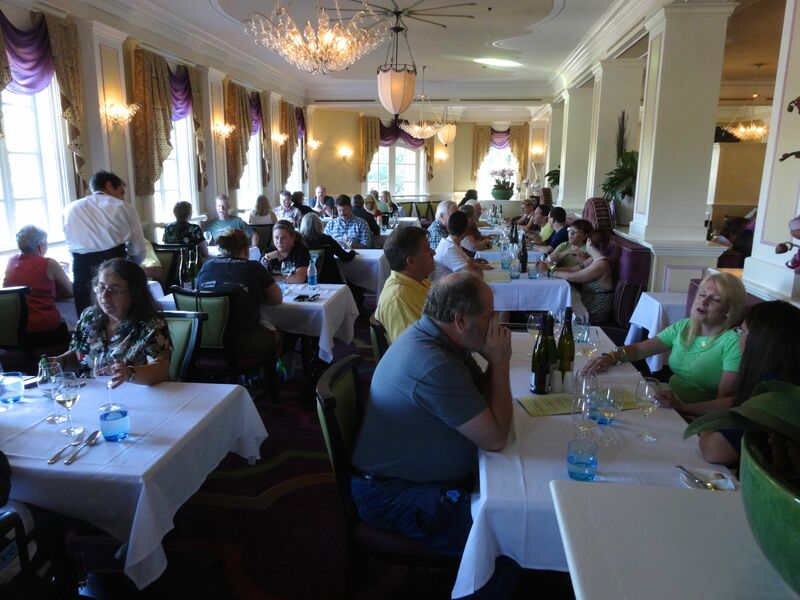 The seating experience was pretty much what we’ve experienced at each luncheon during the Food & Wine Festival… However, we were pleased that the venue is decorated to be a quiet intimate experience and that we had a table for four with a banquette for our group. There wasn’t much space between our table and the one next to us, there was even less space between our table and the wall next to us (this made service a bit difficult at times). So, at first glance, we thought WTH? 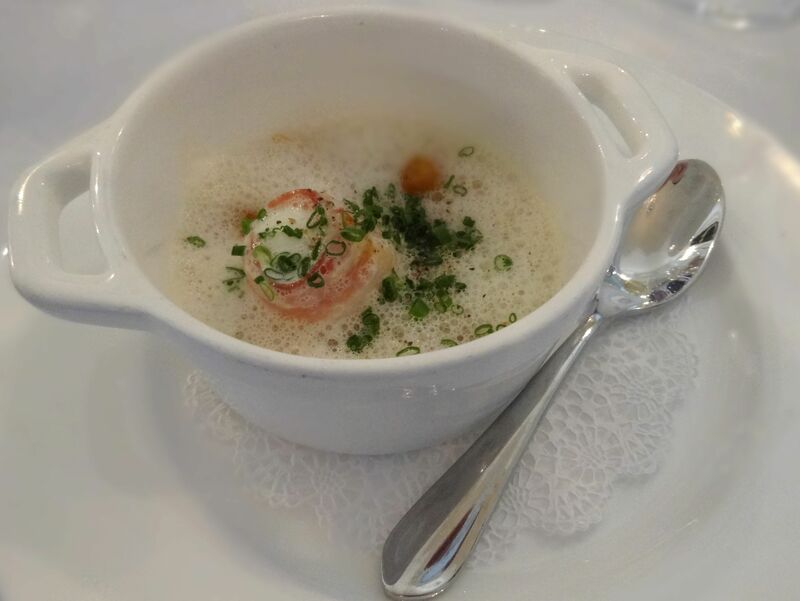 First of all, an amuse bouche isn’t considered to be a course by us… it’s an intermezzo (between courses) or a tempting taste… not a course. Then we started joking (quietly amongst ourselves) that maybe each wine was a course, but that added up to eight courses. Oh well, time to stop joking around, we’re here, there isn’t anything on the menu that grosses us out, we’ll just roll with it and have a new experience! Patrick was here from Pierre Sparr winery. 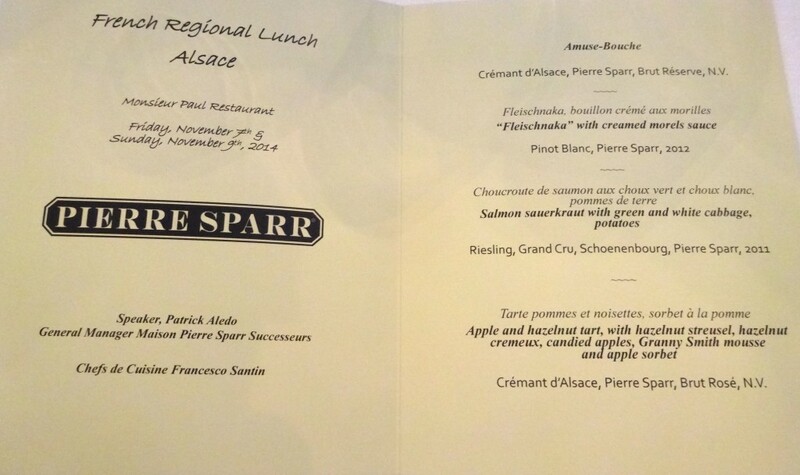 Alsace is small and it borders Germany. At times in its history, it’s been French and at times, it’s been German. 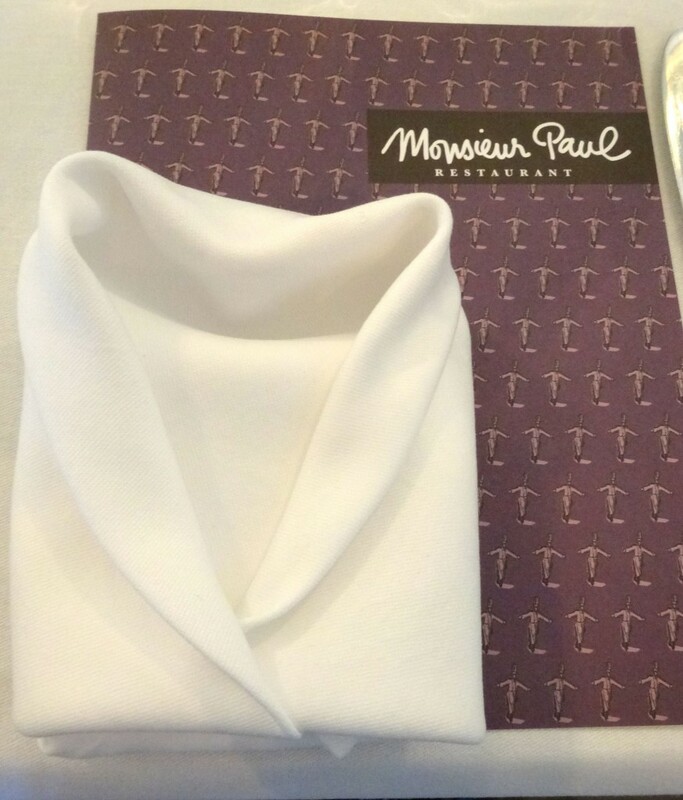 The menu and the food reflect that. The wines today are all white wines. 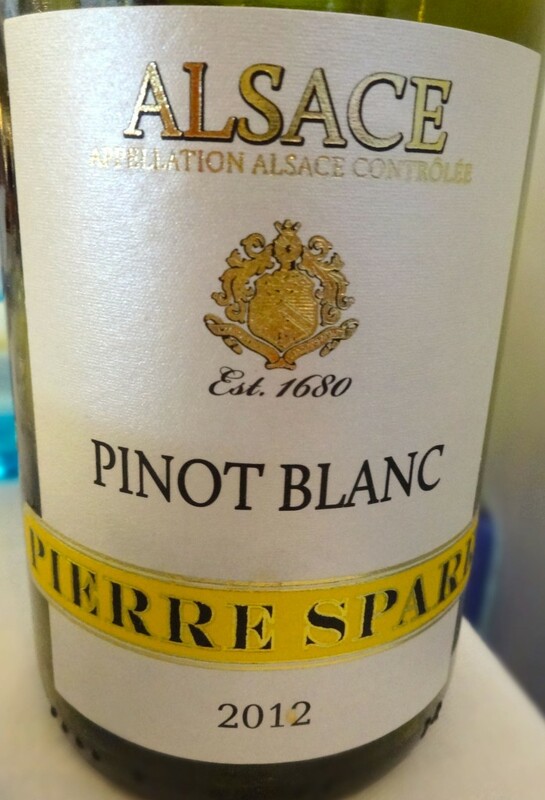 Alsace is well known for dry reislings. Which caused me to comment, that the American habit (probably influenced by California winery advertising) to drink wine just to drink wine, is not very common around the world. 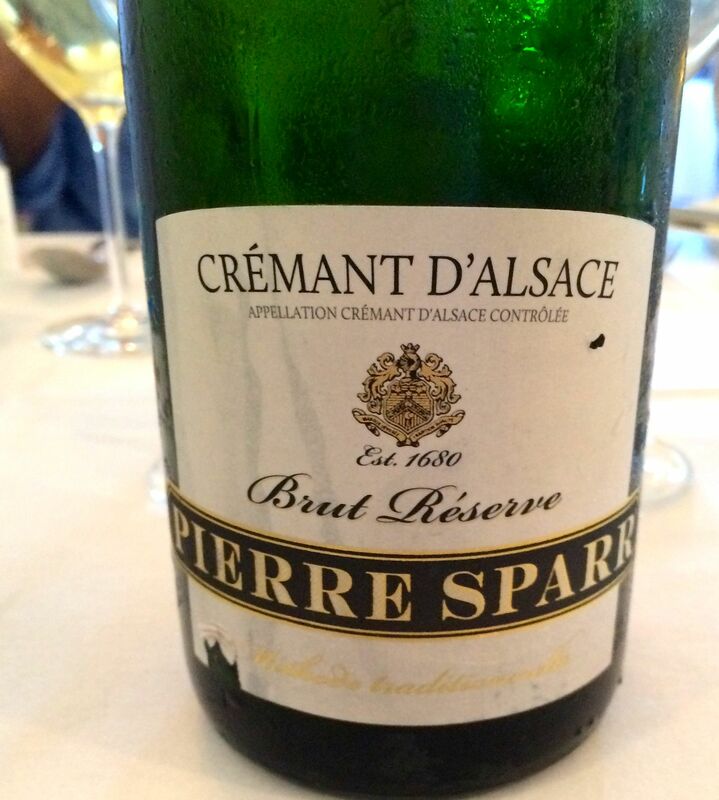 Amuse-Bouche and Crémant d’Alsace, Brut Réserve, N.V. 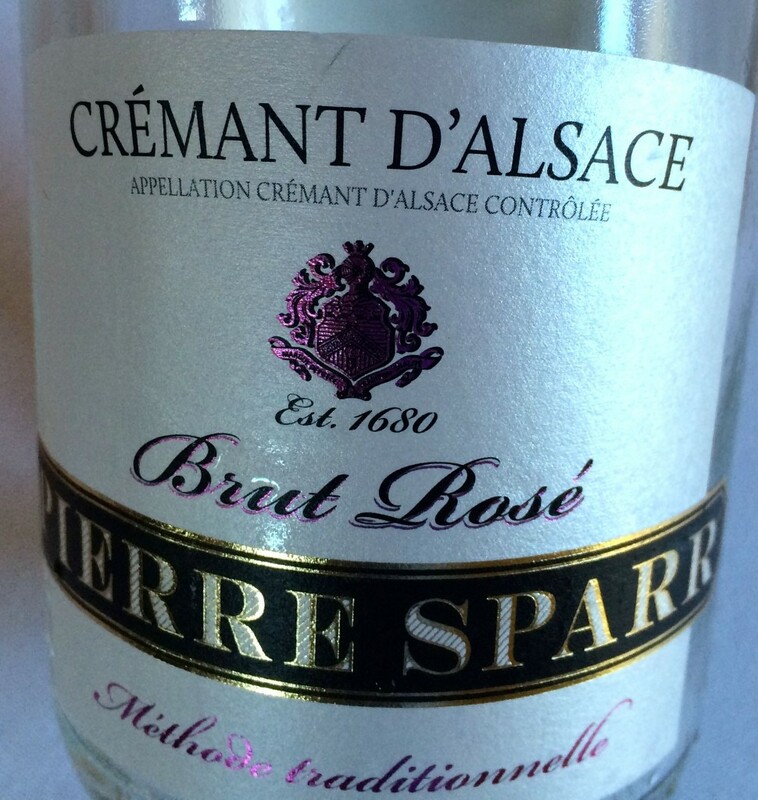 The wine: the Crémant Brut Réserve is fermented for a minimum of 15 months before undergoing a second fermentation in the bottle. 75 cases a year are exported to the United States. 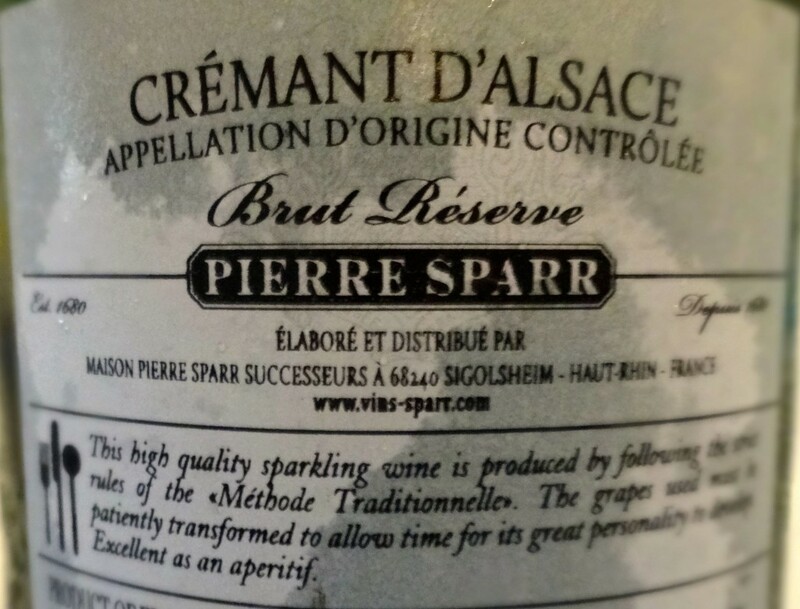 Patrick said that this is a very dry sparkling wine. I thought that it had very light bubbles (until Lisa and Andy pointed out that it was served in a wine glass, not a flute, thus the appearance of light bubbles). Lisa didn’t find this wine to be as dry as she expected. I thought it was okay, not a lot of fruit… we aren’t going to run out and buy a bottle of this. 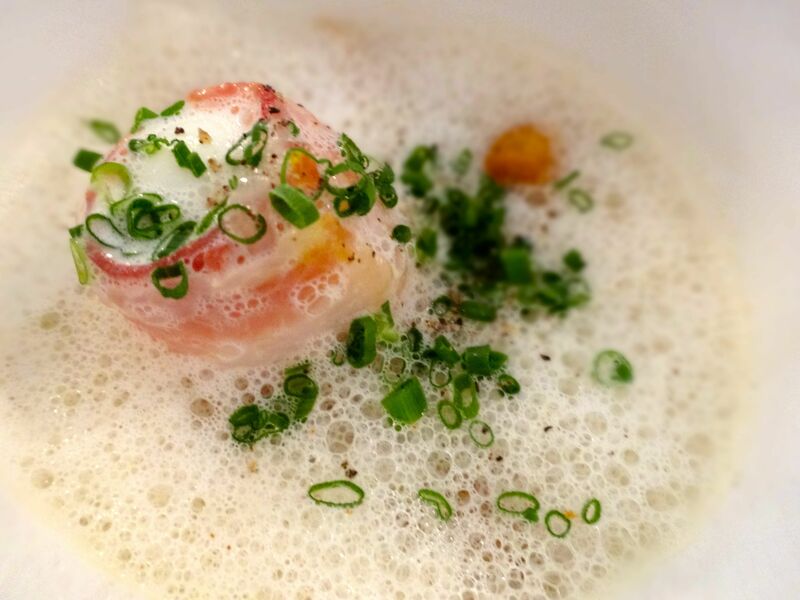 The amuse bouche was quail egg, bacon, sturgeon, sturgeon roe, croutons and foam. This had a lovely smokey aroma and taste. 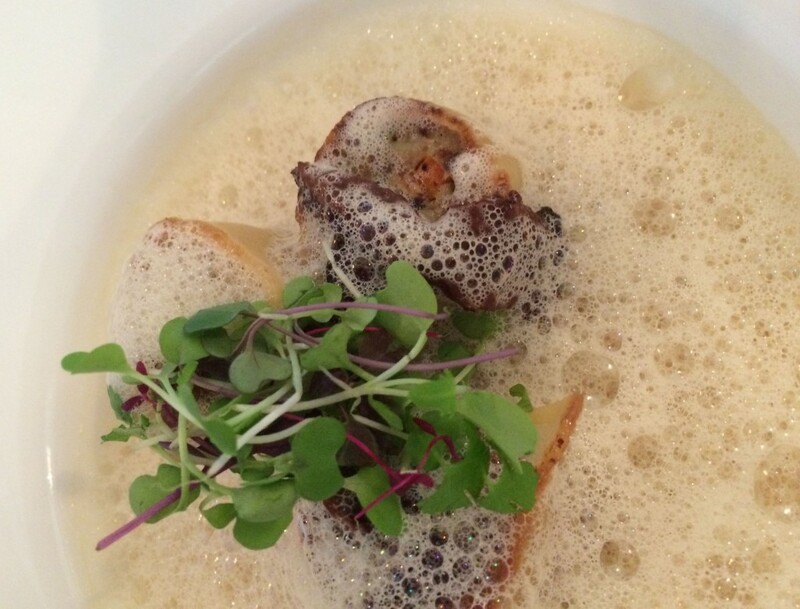 The foam was more flavorful than you might expect. 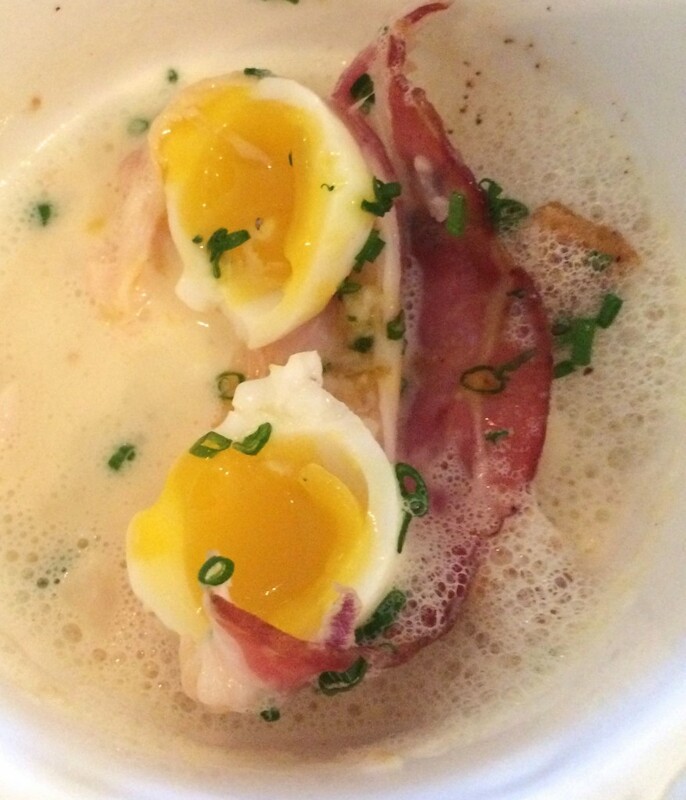 And the quail egg yolk was still a bit runny. I thought that this “course” was nice but not amazing. I could happily eat it now and again. It was a bit difficult to get a taste of everything in one bite because of how the egg was wrapped in bacon. The pairing of the sparkling wine and the amuse bouche didn’t really impress us a whole lot (keep in mind, we aren’t huge fans of sparkling wine). Fleischnaka means “snail” but we aren’t eating snails today. 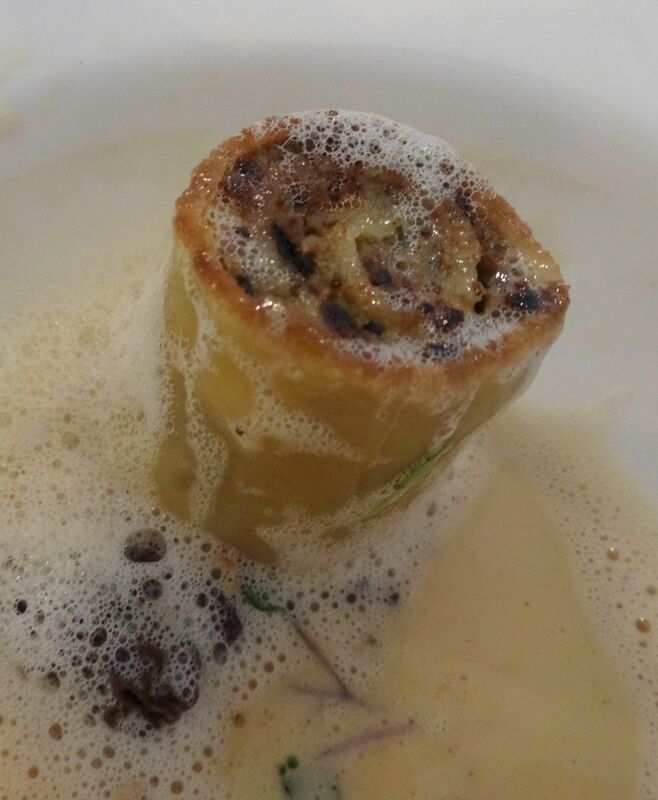 We’re eating a “snail-shaped” roll filled with mixed meats. 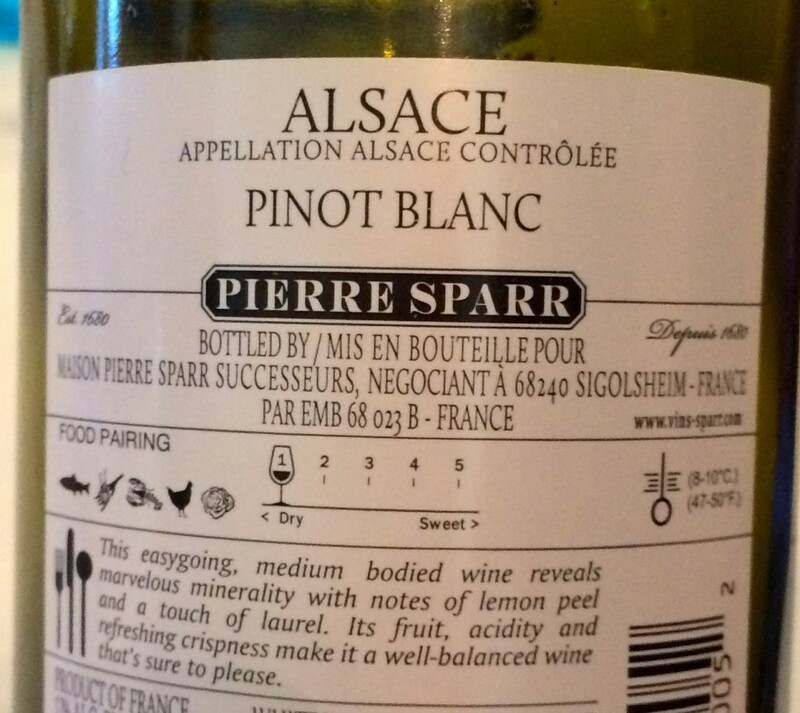 Regarding the wine: fruity doesn’t mean sweet and dry doesn’t mean sour. The wine is left on the lees for 10 months, it’s filtered in May or June the year following harvest. 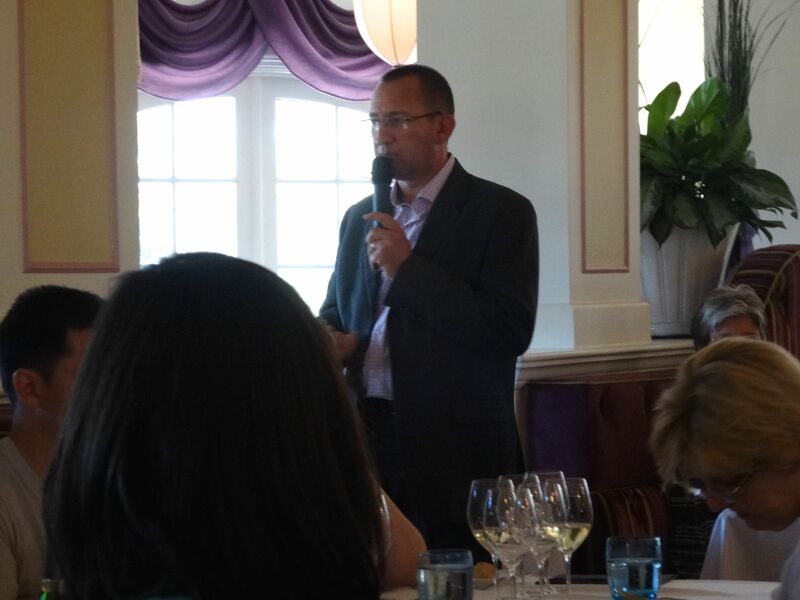 Patrick pointed out that you can age white wines (Grand Cru), the idea that you can’t is a fallacy. Nose: Nick got hints of unripe cantaloupe. Lisa and I got banana and green apple. Taste: We got soft fruits, as it warmed slightly it began to grow on us. Nick and I both liked the pairing of this wine with the Fleishnaka. I liked how this dish came together. 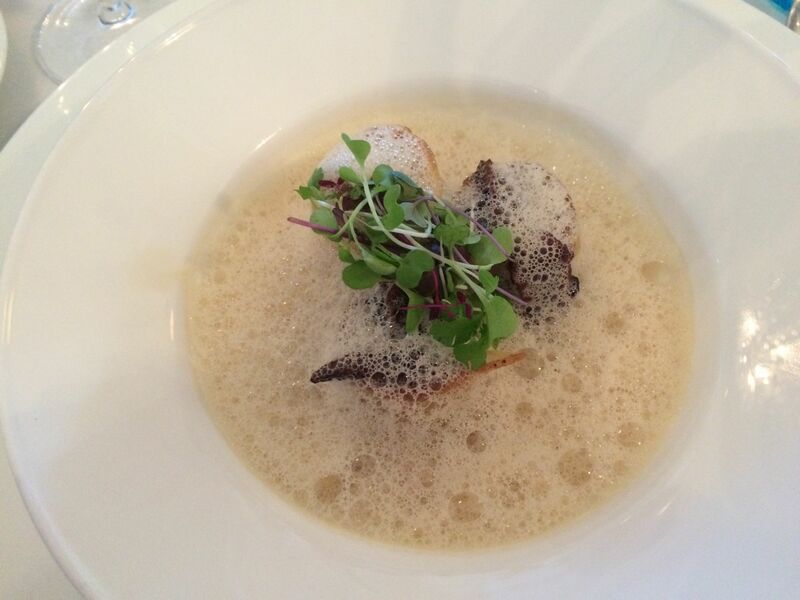 The mushroom broth, the bits of morels, and the meaty fleischnaka were very nice. The fleischnaka were little “snails” of pasta and mixed meats, the flavors were very nice. 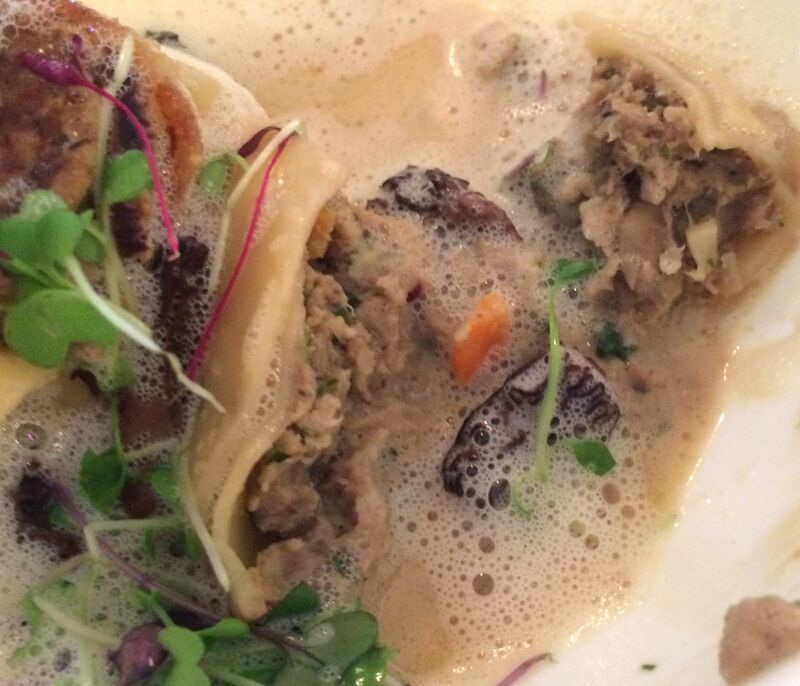 A close up of the dish. 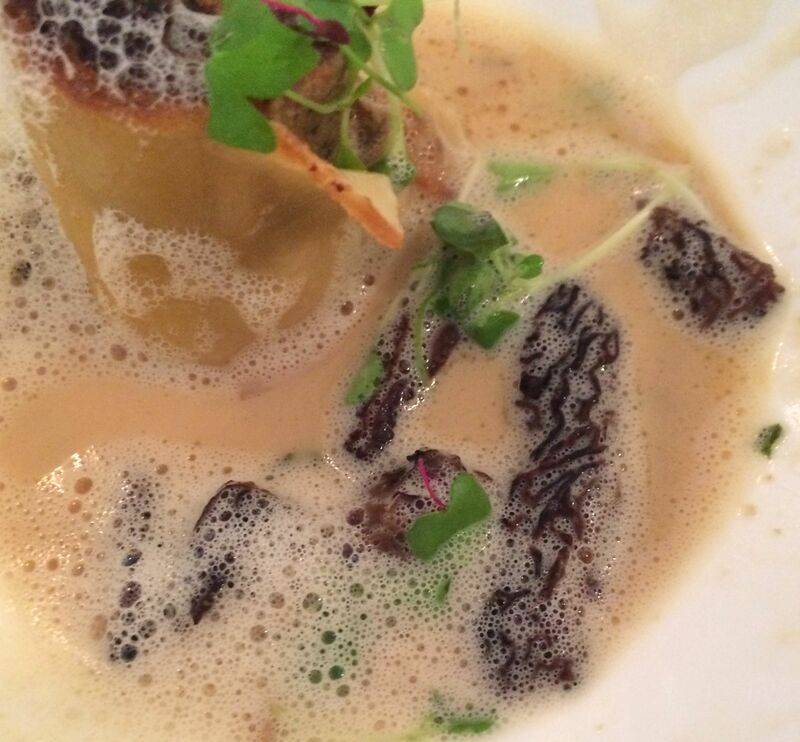 See those lovely meaty morels? Here you can see the interior. 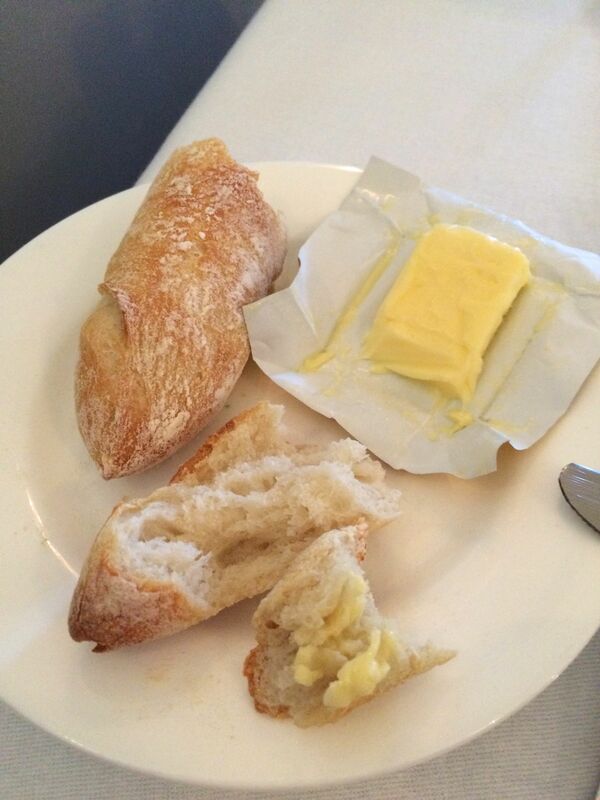 The pairing of this dish with this particular wine really worked well for our palates. My mouth actually waters when I think about it … that rarely happens! 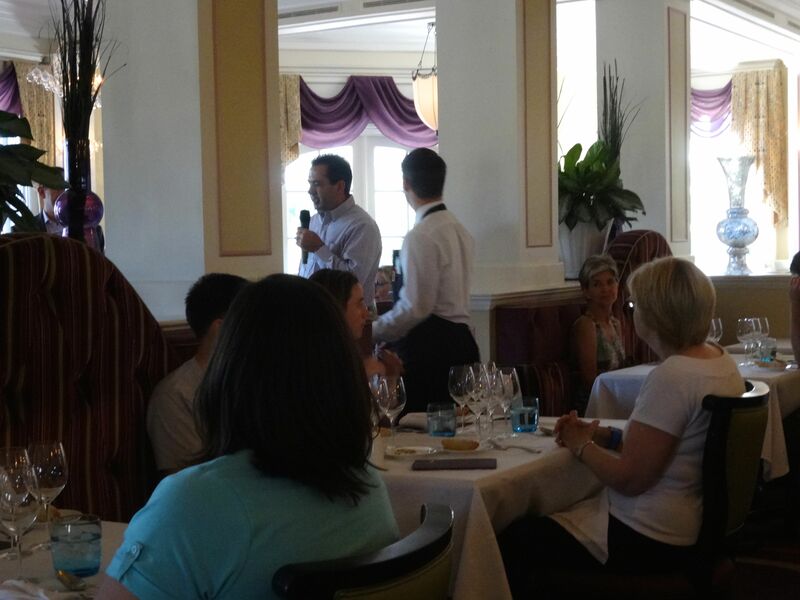 This is the manager of Monsieur Paul’s Restaurant at Epcot. 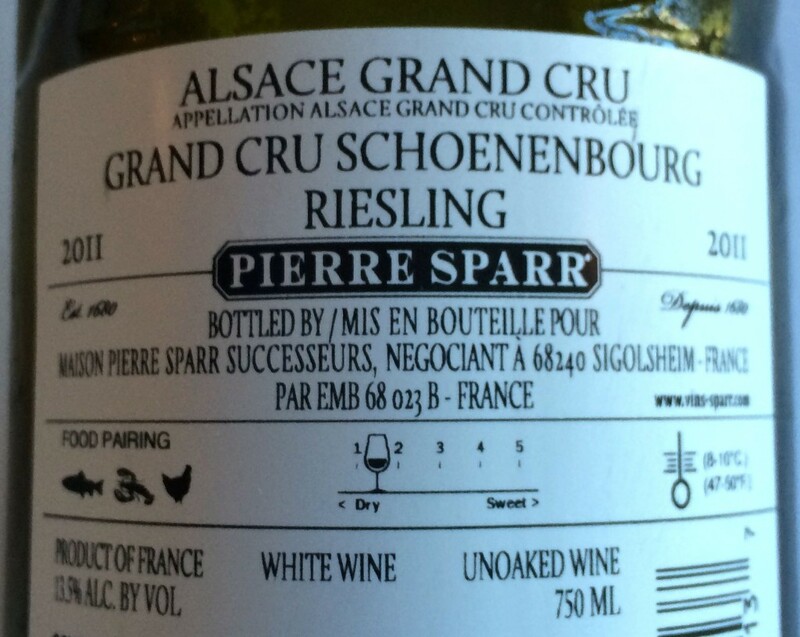 This is Patrick from Pierre Sparr. This wine comes from a very cold climate (Shoenebourg is the parcel the grapes are grown on). There are 51 parcels in Alsace where they can grow this grape. 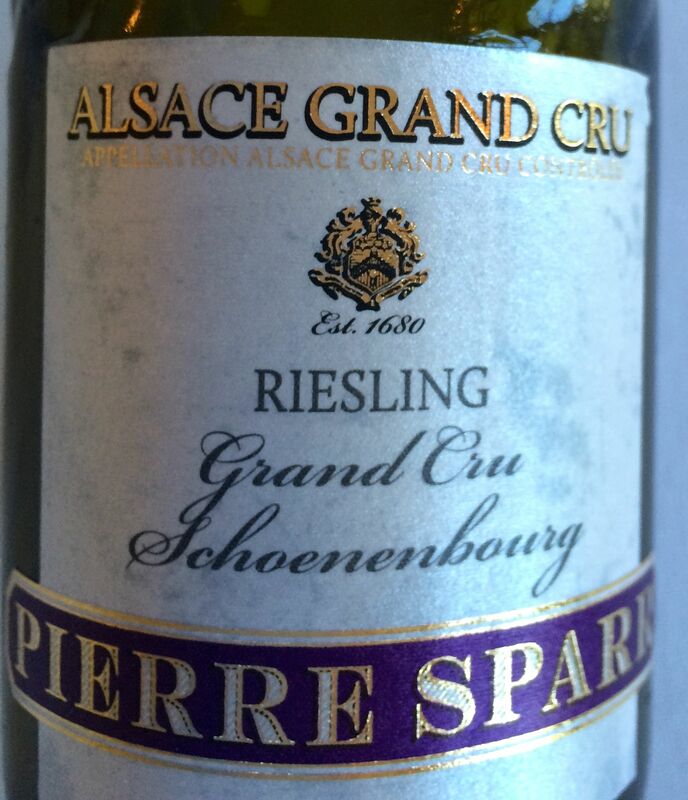 Remember about aging whites, this Grand Cru can be aged for over 20 years – the flavors will change throughout that time. We like Rieslings that aren’t too sweet or too dry (in other words, Nick and I like balanced Rieslings) – so we were looking forward to this wine. The nose was fruit forward and there was a bit of minerality. The flavor was really to our liking without food. The color was deep straw. 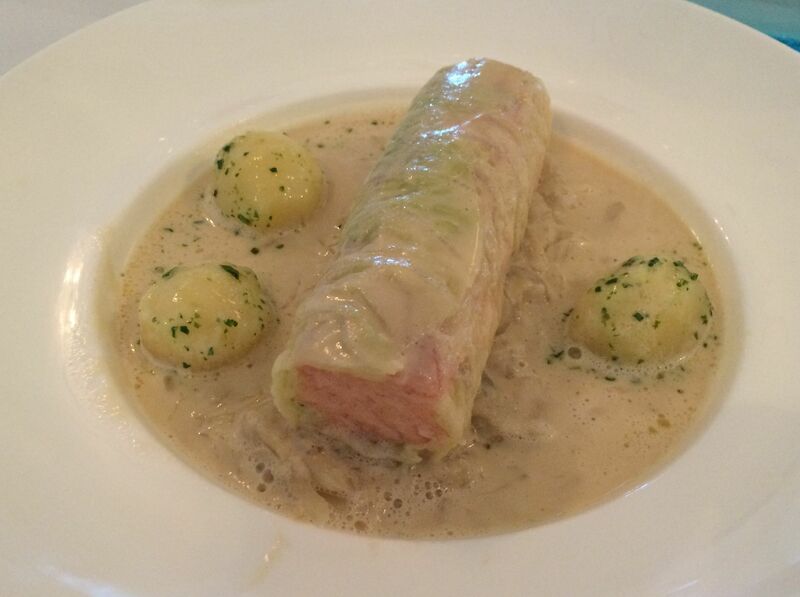 We had high hopes for the salmon with sauerkraut paired with the riesling… in the end, we both agreed that the previous pairing was a better pairing of food and wine. 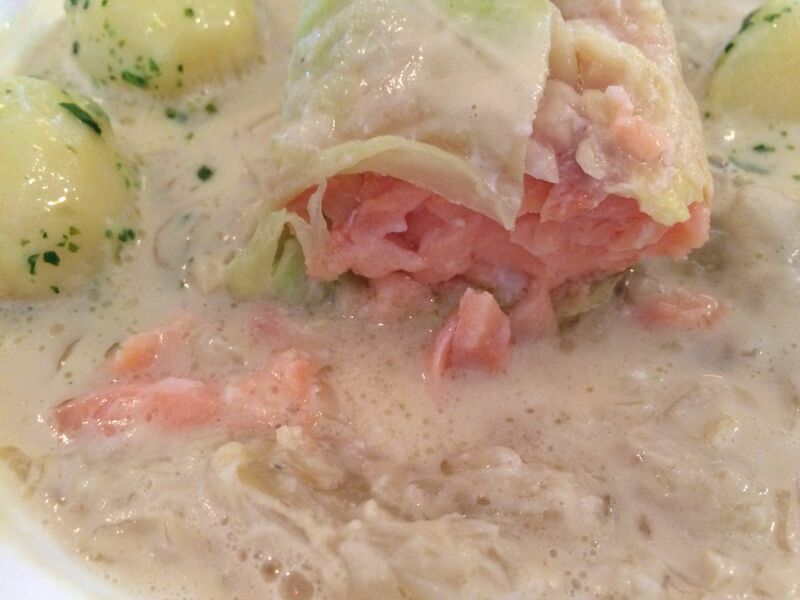 The salmon was poached in a wrap of cabbage. 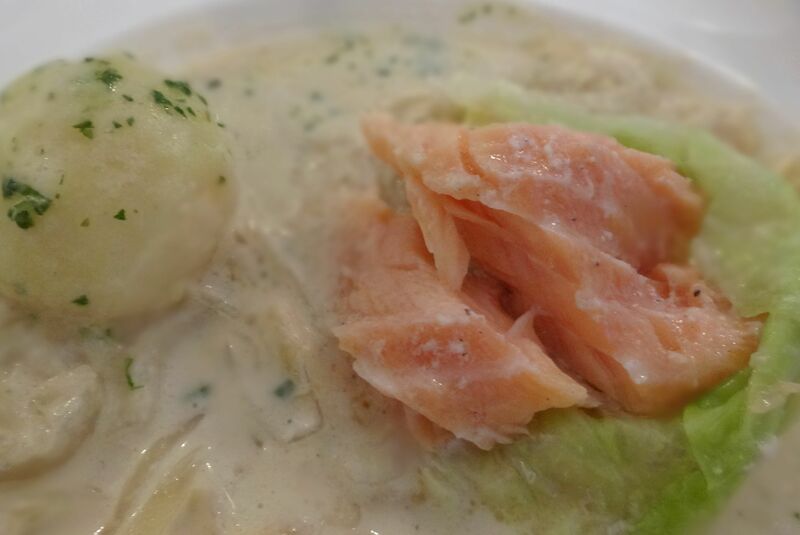 Lisa doesn’t typically like salmon, but she really enjoyed this dish (she didn’t get any sauce because it had shellfish [lobster] in the sauce, however, it came dry… seems they could have made a lemon butter sauce or something to give it a bit of moisture). 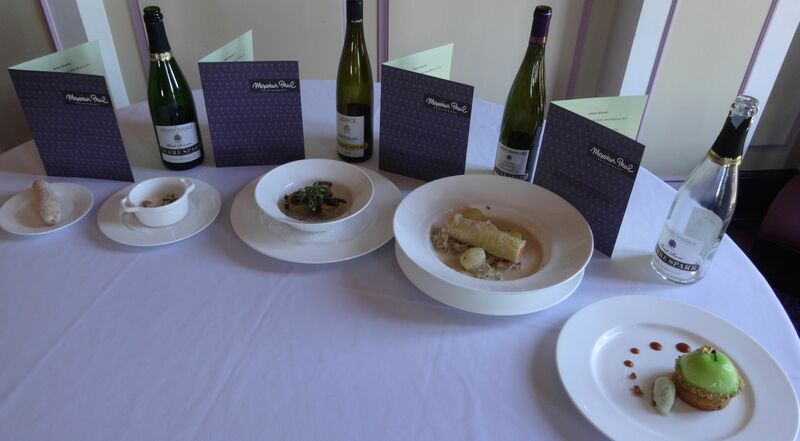 We expected that the sauerkraut would brighten up the dish with some acidity and that would pair well with the slight sweetness and fruitiness of the wine. Nope. 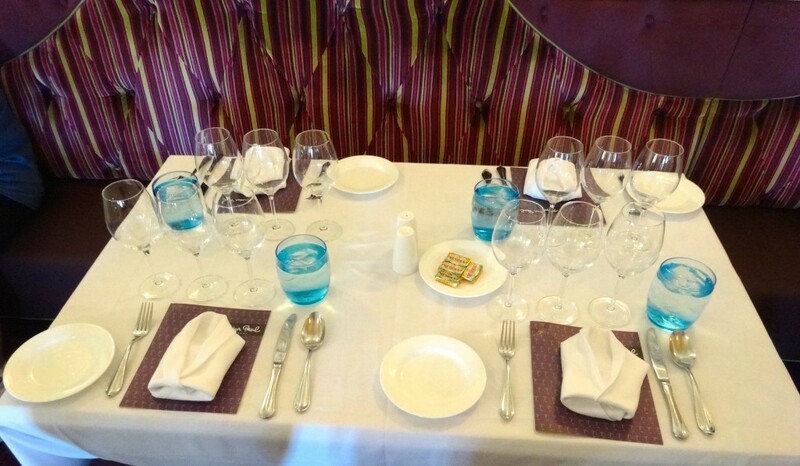 The dish seemed sweet overall and that made the wine seem even sweeter… it was too much sweet. The sparkling rosé is pure Pinot Noir grapes, the skins add color (only Champagne can blend red and white to make rosé). Patrick said this was a dry rosé and that it would be perfect with the tart and to drink on its own. There should be lots of strawberry on the nose and the palate. We didn’t care for this wine. Nick didn’t like the smell and I thought it smelled “pink”. The bubbles failed to impress our palates – Nick doesn’t care for them and I thought they were salty. This rosé was very dry to our tastes. The color of the rosé was a lovely salmon pink. The dessert was quite good (I had expected something chocolate and decadent to the Nth degree). 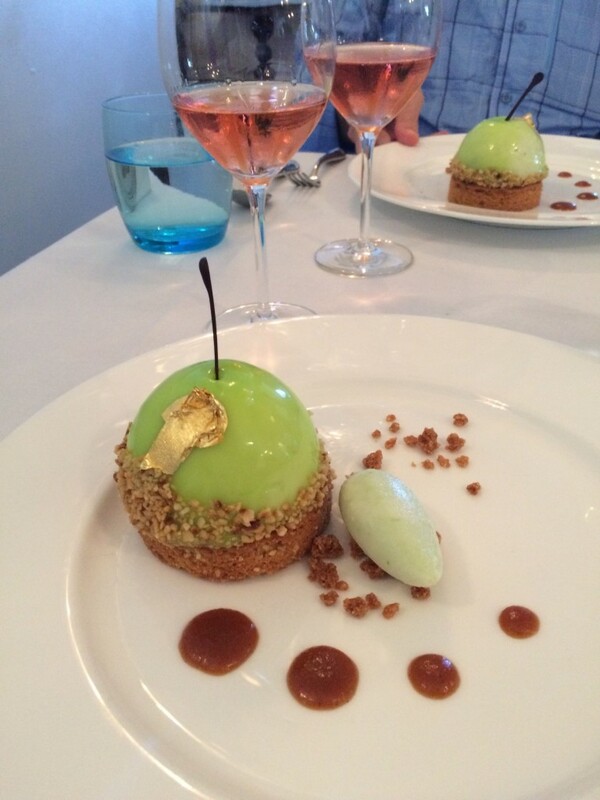 That said, the rosé was just tremendously sour paired with the apple tart. The tart had a hard crust of hazelnut pastry, then there was a layer of hazelnut cream. 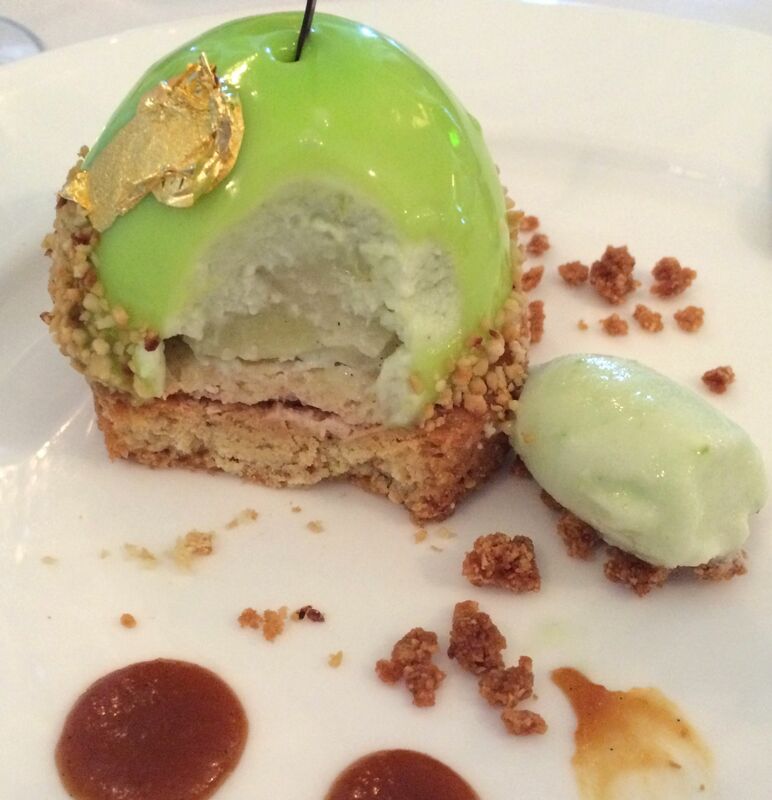 This was topped by Granny Smith apples and mousse, edged with hazelnut streusel. The sorbet was a big hit at our table. 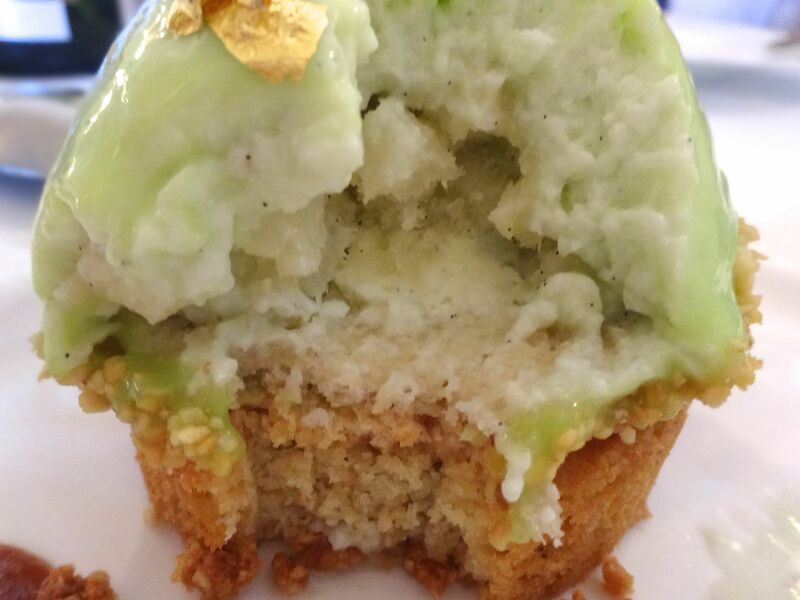 And you may have noticed the little bits of gold foil on the dessert. 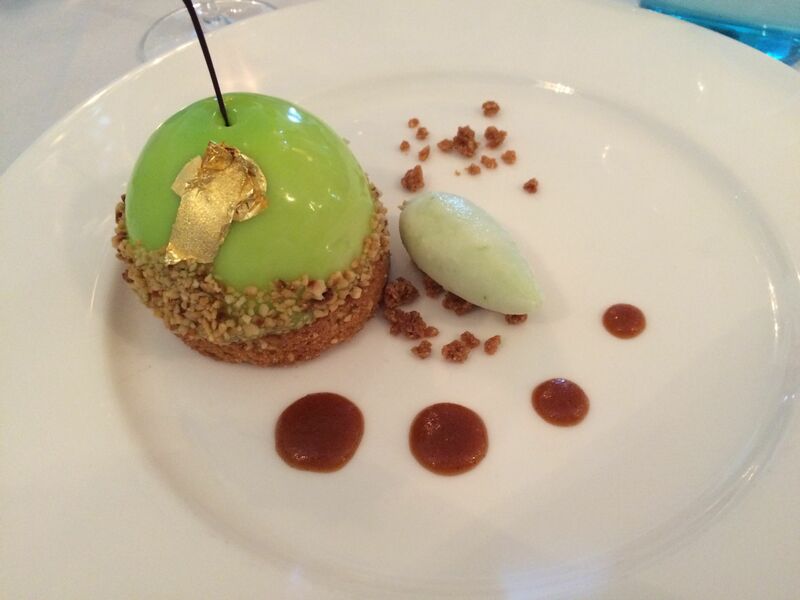 When they started bringing these out, I thought that it was a baked apple because of the stem (nope, that was my chocolate!). 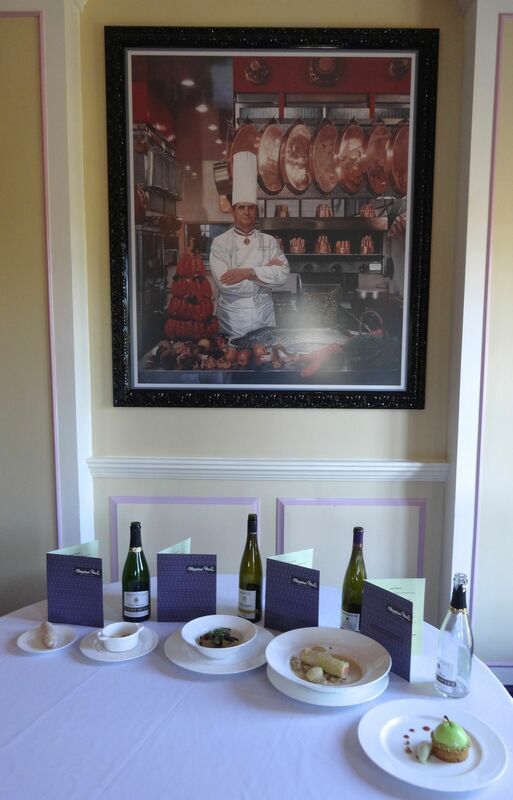 They had set up a table with the wines and plated courses. 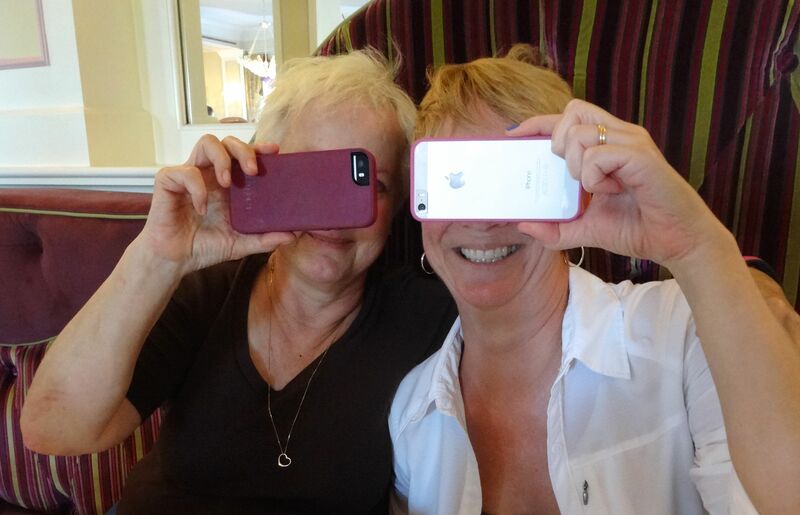 One last photo, Nick snapped this one of Lisa and me goofing off with our iPhones – thought we’d share with our readers! 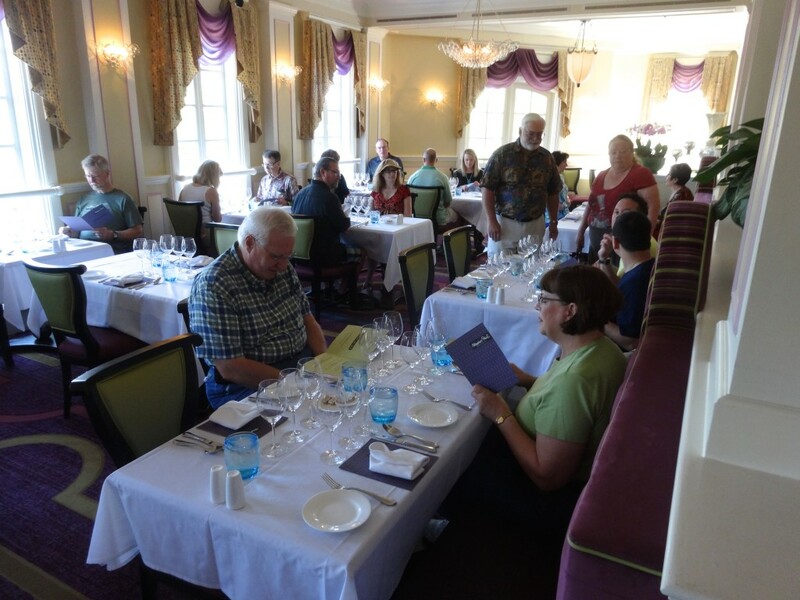 Okay, so we did something new (well, it was new to the two of us; Lisa and Andy have done wine lunches in France before; they remember there being more courses and more wine though)…. 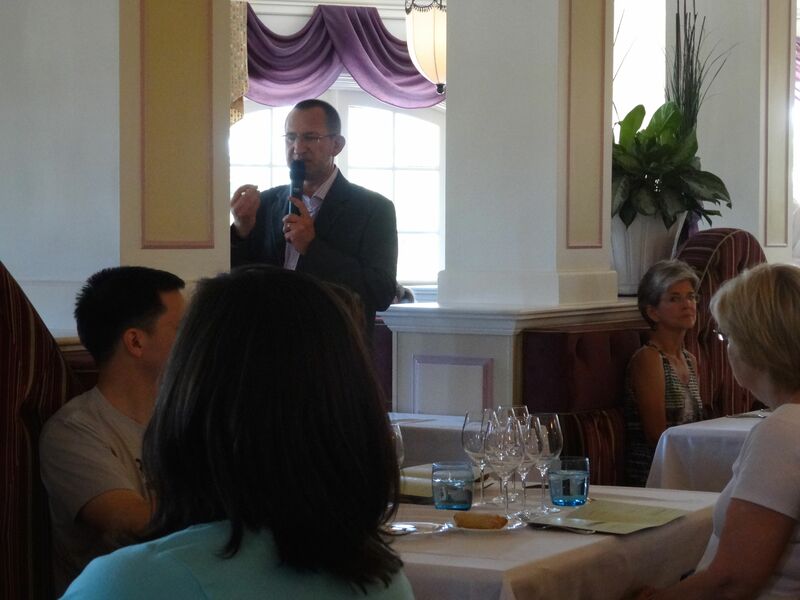 It was not bad but I’m not sure that we feel any need to put the French Regional Wine Lunches on our Must-Do-Every-Year List. 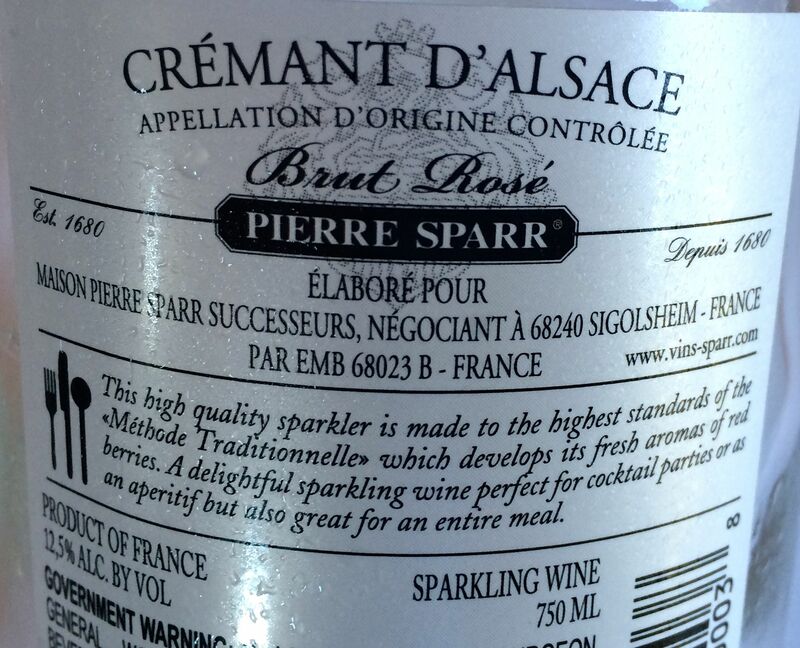 We might consider doing a different region (not Champagne though!) in a couple of years with Lisa and Andy again. One of the best things about this wine lunch? The venue was quieter than most. @extrawdwmagic I have liked very little salmon in my life. 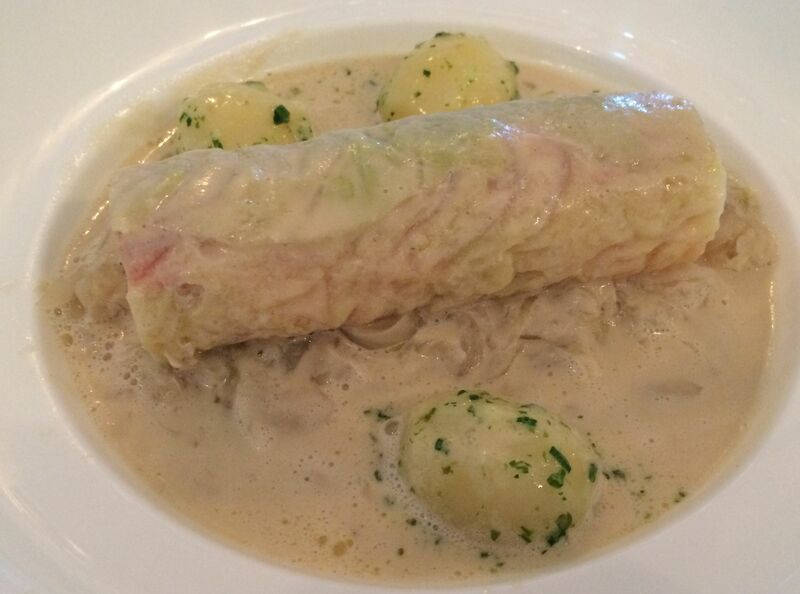 But I keep thinking about this dish. 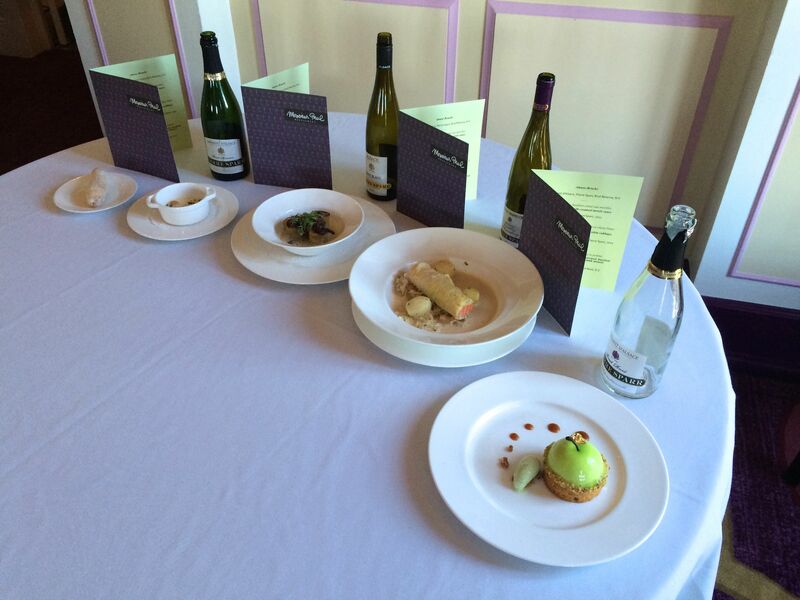 @extrawdwmagic but wrong wine with the beautiful Apple desert!